Something to look forward to: Capturing 360 degree footage for VR used to be very difficult, requiring complex camera setups and post-processing to stitch the individual videos together. High quality 360 degree VR cinematography requires some serious camera horsepower and Insta360's Titan is built to handle it. The camera has eight lenses, each with a Micro Four Thirds sensor to capture the full 360 degree field of view. This results in a massive 11K image in two dimensions, or a 10K image in 3D mode. The camera has numerous shooting modes including 11K 2D at 30fps, 10K 3D at 30fps, 5K at 120fps. For those that want higher quality 10-bit color, the camera can do this in 8K at 30fps. Bumping up the processing even more, the camera can also do real-time stitching of the individual video streams at 4K 30fps. The Titan has a built-in streaming server that can stream at 4K 30fps while simultaneously capturing 8K. With each of the 8 cameras pumping out 180Mbps, you'll need some serious storage to keep up. The Titan requires 9 SD cards to deal with all of the data being produced; one for each camera and an additional to store GPS and stabilization data. Positional audio is captured with four mono microphones. The unit has a built in battery, but with a power draw of 170W, it won't last too long. Insta360 has also included Wi-Fi connectivity, although it only goes up to 802.11n. For better remote management and previewing, the camera features Insta360's Farsight monitoring technology. Finally, the camera features an advanced 9-axis stabilization system they call FlowState. At $15,000, this camera is definitely not for the home user though. 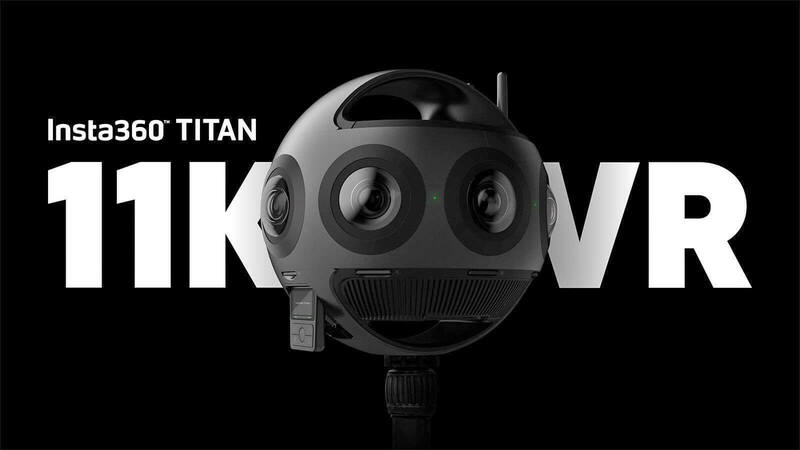 Insta360 is previewing the Titan 11K camera at CES this year and they plan to have it ready for launch in April.